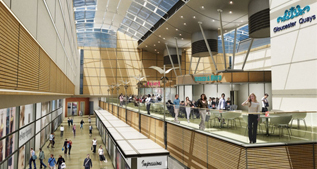 Site Engineering Surveys Ltd carried out a survey of Park Place Croydon shopping centre on behalf of Bovis Lend Lease to enable the designers to plan the new development in the area. 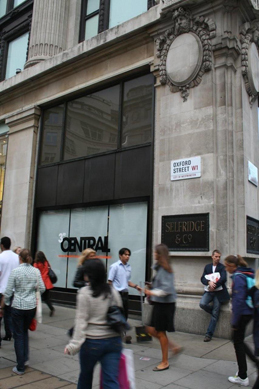 Our scope of works included for an elevation survey of the retained façades along George Street, North End and inside the Whitgift shopping centre. Surveying these façades using traditional survey techniques would be extremely time consuming and costly. It was therefore decided that 3D laser scanning would be far more efficient in time and cost, with the added bonus that it would pick up all the intricate detail of the façade. 3D laser scanning allows the complete and accurate capture of 3 dimensional complex structures. The scanner used (Leica HDS 3000) can acquire up to 4000 points per second to an accuracy of 6mm over a 50m range. Any exposed surface can be remotely captured in minutes to form a dense and accurate "3D points cloud". Once the fieldwork is complete then each of the point clouds is mathematically linked together using common targets via the Leica Cyclone software. From the final point cloud a variety of deliverables can be produced from 2D plans, elevations and sections to 3D wire frames, models and visualisations. From a safety point of view the instrument can be set up remotely in an area away from hazards. As it uses a non contact (class 3R laser) survey technique it is ideal for surveying inaccessible and potentially dangerous areas e.g. roads, rail and high rise areas. 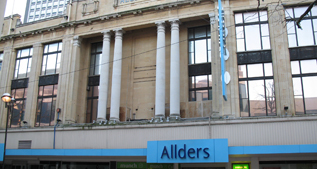 So it was therefore well suited to survey the high level facades in Croydon from the safety of the pavement. 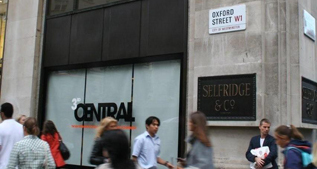 The Selfridges building has a long standing history with the city of London, the impressive 5 story building stretches approx 160m along Oxford Street. SES has been appointed to survey the external footprint of the building and key internal structural elements creating accurate and up to date floor/ceiling plans. These drawings will aid Selfridges in the management and planning of floor space which in turn will maximize their productivity.